As we have learned in the media, George Zimmerman wants to be famous. He goes all Wild Wild West on an 18-year-old boy with a hoodie. Then, he gets busted for having a leadfoot in Florida. Later, he beats his wife. It’s easy to tell how classy this guy is. The dude is probably looking for a reality show to keep his name in the spotlight. He’s about to get his chance (and the rest of America might just tune in to see him get his come-uppins). Today—ironically on Travyon Martin’s birthday—it was announced that George Zimmerman will take part in a boxing match with rapper DMX. Boxing was apparently Zimmerman’s hobby, as he shared with CNN. That said, I don’t think this is what he had in mind. This “celebrity boxing match” will not involve any punching bags or unarmed teenagers; it’ll just be Ruff Ryder spokesman DMX and comedic voodoo doll Zimmerman. The “incident,” as he so cavalierly put it, would be the ballyhoo with Travyon Martin. Damon is Damon Feldman, owner of Celebrity Boxing, and he’s the mastermind behind this beatdown boxing match. While Zimmerman thinks he is going to put his hamhocks in a ring to get on the news, DMX is taking this a skosh more seriously. 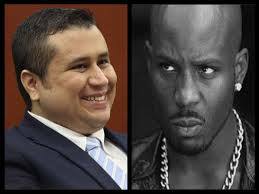 As TMZ reported, DMX promised to “massacre Zimmerman in the ring” if he got the chance. To be exact, he said, “I am going to beat the living f**k out him … I am breaking every rule in boxing to make sure I f**k him right up.” He then said he’d literally piss on George’s face. So, who’s not buying the PPV to see this? Oh, BTW, DMX once starred in a movie with Steven Seagal. That sound you hear is George wetting himself. The date, time, and location of the three-round fight will be announced at a news conference next Wednesday.